AeroExpo UK is pleased to welcome new exhibitor F1 Driver Challenge at the show, taking place at Sywell Aerodrome during 31st May – 2nd June 2013. › Ultra sensitive force feedback steering wheel. › Authentic F1 paddle shift gear change, with automatic option. › High-end in car surround sound audio. › High definition driver monitor. › A choice of over 50 famous racing circuits. All lap times are automatically recorded so Expo visitors can compete with each other, just for fun, as they vie for the fastest lap times and that coveted place at the top of the leader board. 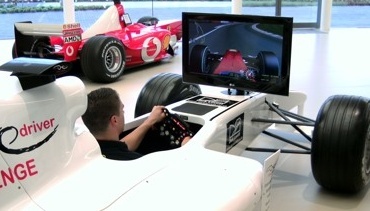 If you are looking for something new and exciting to entertain and engage your visitors and guests, a full size Formula One Simulator might be the answer! Proactive, exhilarating and visually stunning, what better way to impress your friends, entertain your guests and add to the sense of occasion. For our Corporate clients, the opportunity to increase brand awareness by having their company logos displayed on a F1 car is a big attraction and our Private customers can also display their personal messages.